Information concerning the start and end of vegetation growing season has its use in environmental monitoring like studying nutrient leaching or climate change. This article presents methods to estimate phenological features of vegetation growing season using time series of daily MODIS vegetation index images. The methodology has been developed as SM-13 Vegetation Phenological Trends-product of European Union-funded Geoland2-project. 1. Start of growing season A: Day of start of rapid increase in NDVI corresponding to the start of flux growing season (nutrient fluxes start to flow in plants). 2. Start of growing season B: Day when NDVI goes over defined threshold corresponding to birch bud-burst. 4. 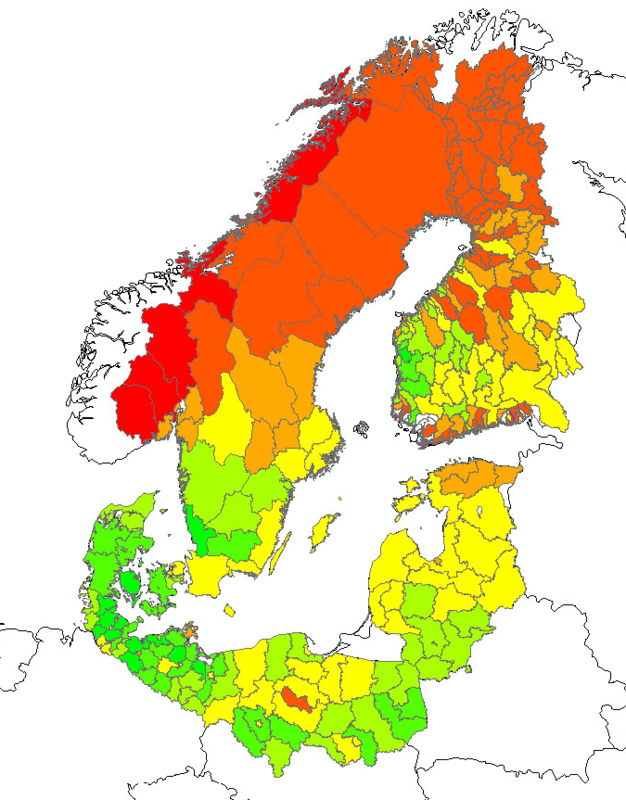 End of growing season: Day when NDVI decreases below threshold corresponding to birch leaf yellowing. 7. Quality estimate for feature 1. 8. Quality estimate for feature 2. 9. Quality estimate for feature 4. The latest version of the product has been made for Baltic Sea drainage basin and years 2001 - 2010. Phenological features are computed for land cover types: agricultural areas, coniferous forest, deciduous forest, mixed forest and open wetland (open bogs). These are defined using Corine Land Cover classification. The used administrative units are hydrological drainage basins in Finland and NUTS3-areas for other areas. Processing starts by computing mean NDVI-curves for land cover types (red x in figure 1), averaging them (blue o in figure 1) and filling the gaps using linear interpolation (green line in figure 1). Then interpolated time series is filtered using derivative 1st and 2nd order filters. Feature 1 is computed by combining these derivatives. Features 2 and 4 use thresholds, which are computed based on average of growing season minimum and maximum NDVI. Feature 3 is defined using maximum NDVI, i.e. is the days with maximum NDVI. Also, quality estimates for features are computed which indicate how likely it is that corresponding feature has been estimated reliably. Figure 2 presents an example of the extracted features and their quality indicators. In-situ measurements have been provided by Finnish Meteorological Institute (plant flux measurements, 3 sites) and Finnish Forest Research Institute (plant phenological observations, 5 sites). Residuals of extracted features can be about 2 days in the best case but are typically around 7 days. In the near future, more detailed validation will be made using more in-situ sites and measurements. 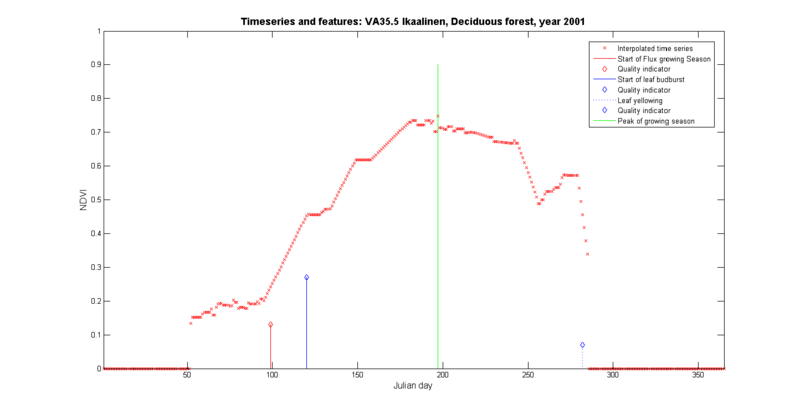 Figure 3 presents the extracted feature 3 which should correspond to birch bud-burst for year 2010. Color green means that phenomena has happened before Julian day 100 (early April), yellow days 120 -130 (early May) and red after day 150 (Early June or later). Same processing chain can be used for NDVI-images from coming Sentinel-2/3 satellites. Figure 1. Raw, filtered and interpolated MODIS NDVI-timeseries of drainage basin VA35.5 for deciduous forest and year 2001. Figure 2. Interpolated MODIS NDVI-timeseries of drainage basin VA35.5 and extracted phenological features with their quality indicators (height of extracted feature, higher means better quality). Figure 3. 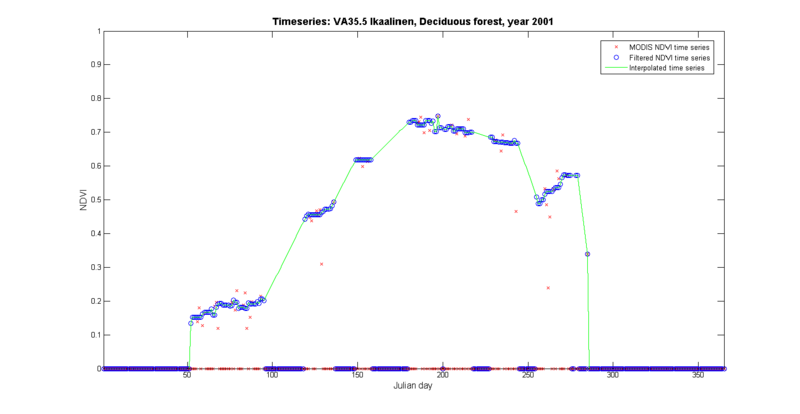 Extracted feature 3 which should correspond to birch bud-burst for year 2010.